If you’ve ever dreamed of marble countertops and then nearly fainted at the price, you NEED today’s post! When I saw how Ronda from Batchelor’s Way had created faux marble countertops for her laundry room, I begged her to share the tutorial with us here because it is going to knock your socks off! This project was so scary for me, but I am so glad I overcame my fears and did it because I am happy as a clam with my new countertop! FIRST, if your countertop isn’t already fit to the space you’re putting it in, cut it to size. Ours was an odd L shape, so my husband used a radial hand saw and straight edge to cut the rectangle and then I used a jig saw to cut out the arm at the end. We scribed the “L” shaped area to get a really close fit — very important since nothing was really square. Note: We have lots of questions asking if you could paint your already-installed countertops in place — yes you can! See more about the finishing process in this glossy painted countertop tutorial, and read more tips for painting countertops here. Next, fill in any holes or blemishes in the countertop so you have a nice surface to start painting on. I just used wood filler (Dry Dex Spackling by DAP) and sanded it smooth. Prime with a white primer for glossy surfaces. I used two coats. Once the primer is dry, lightly sand the whole surface. Mix your paint. I just used leftover paint to mix up three different colors of gray: a very dark gray, a medium gray, and a light gray. Now you can start painting! I suggest painting a couple of sample boards to get comfortable with the technique and learn what look you like. Start painting by dipping the sea sponge into the lightest gray paint and dabbing it on to create the light/dark marble variations. Add the marble veins by dipping the tip of the feather into the darker gray paints and dragging and wiggling it across the countertop. Occasionally flip and push the feather (rather than pulling it) to create natural looking veins. Then lightly dry brush the vein with your cheap bristled brush to soften it. Sponge over any of the veins with the lighter colors to soften the vein or create a feeling of depth. To give your countertops a truly remarkable faux marble finish, you need glitter! Not large pieces of glitter like I was originally picturing when I read about putting glitter on faux finish countertops (duh moment!) — use a very fine glitter, the kind that looks like sand or dust. I used the white iridescent glitter from a Creatology brand glitter pack from Michael’s. You should dust the countertop with glitter while the paint is still wet, but I just sponged white paint wherever I wanted the glitter and then sprinkled it with fine iridescent white glitter. It really does look like natural mineral deposits on your faux marble! Most of the faux granite/stone countertop tutorials I read used a product called EnviroTex Lite to seal their countertops. You can buy it at Hobby Lobby or online. I didn’t want to drive to the other end of the valley to Hobby Lobby or pay shipping to order online, so I looked around a bit and found that I could get a similar product at Home Depot, which was a much shorter drive. It’s called Super Glaze, and it is a two-part epoxy that pours on and is the equivalent of using 60 coats of varnish. I bought two boxes ($25 each) based on the information on the package, but I only ended up using one (and had a lot left over) to cover my counter of approximately 6 square feet. First, tape off the raw edges of your countertop. You don’t want any epoxy build-up on them or the countertop might not fit back into place. Place a good drop cloth beneath the project to catch all the runoff — the resin will not come off anything it comes in contact with. Level the counter; the Super Glaze self-levels and you’ll want it to spread out evenly. Next comes the scary part: mixing the epoxy! Read the directions on the box and follow them very closely. I mixed part A and part B in a bucket and stirred for the required time, even having my sister time me so it was exact! At this point, the mixture looks yellow but it will spread out and dry clear, so don’t panic! Following the directions, I poured the mixture into another bucket and stirred for the required time again. Then, it’s ready to pour! Once you pour some epoxy on the countertops, start spreading it out. Anything you use to spread it will have to be thrown away, so use something disposable. Bigger spreading tools will make it easier! I used plastic putty knives I had on hand, but I wish I had listened to my mother and picked up the $2 giant disposable spreader at the store. Smooth out the mixture as best you can and let it run right off the edges. It looks like glass. It will level as it sits, and you have to work quickly to get it spread before it begins to set up. Under the front edges, I used a sponge brush to catch the drips so they wouldn’t harden and create a bumpy edge. Do this several times during the first hour as it dries. You’ll also want to remove the tape around the raw edges of the counter — I removed mine within the first hour after pouring the epoxy. Once the surface is covered, DON’T TOUCH IT! But do look closely for air bubbles. Other tutorials that I read used a blow torch or their own breath to pop the bubbles. My torch wouldn’t light so we just blew on all the air bubbles that we could find — if I did it again I would try the blow torch. After you get all the bubbles out, let it sit for 3 days to dry and cure (according to the package directions) and then you can install it. YAY!! If this process still makes you a little nervous, we’ve heard really great things about this gray granite/marble contact paper that sticks directly to counter tops. It’s supposed to be very easy to work with and looks very real. It may be a great solution for countertops that don’t take too much abuse and/or smaller DIY projects like coffee tables, etc.! Amazing job, Yael! It looks beautiful! Thank you for sharing! For more details, visit her blog at Jewish Latin Princess. Wow, this is stunning! Great tutorial. That is truly amazing! I have to try this…. Thanks for sharing! We’d love to see pictures if you do! Thanks! Wow those look amazing, who would have thought it was painted. Crazy! I agree! Thanks for commenting, Amy! That is truly amazing. I think I will eventually try that in my laundry room (to go over pink laminate) to match our new quartz kitchen countertops. Thanks! We’d love to see some pictures when you try it, Beth! WOW!!! Love the look of the new counter tops! I really appreciate you sharing your experiences and insight. Very welcome advice! Someone I know just remodeled their vintage home with Carrera marble counter tops. Um.. no. Never ever EVER have real marble counter tops. Too great of a risk of staining. Unless you like the look of stained marble. WOW!!!!! This is brilliant!!! My question- I would love to do this on my bathroom counters (they are currently a pinkish cultured marble- yuck) and I’m wondering if this can be done with the counter tops already installed? My sinks are part of the counter and not separate, do you think this would hold up for the inside of the sinks? Would love your input, thanks! I’m curious about this myself. I have ugly blue laminate countertops and would like to use your method. Will painting like you have done over existing laminate pose any foreseeable issues? 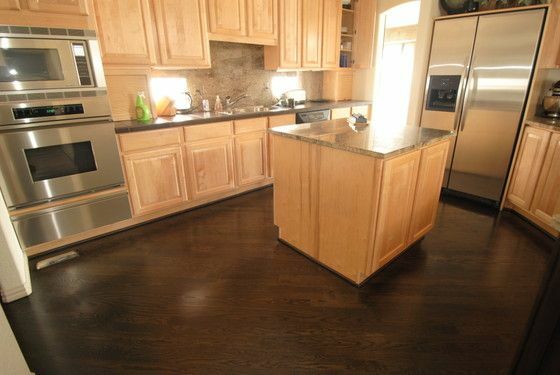 Mikey: I’ve seen people use just a lacquer over their faux painted laminate counter tops and they say they still look great 3 and 4 years later! So I don’t think there are many, if any, foreseeable issues at all. Epoxy is a super-duper hard shell, basically. I’m sure it can scratch, but I don’t think it scratches any easier than a laminate counter top. I’d go for it if I were you!! Good luck! did you get an answer? I have the same question!! Hope that helps! We’d love to see photos if/when you paint your countertops, too. t. Where do you begin when you do start the pouring of the apoxy? Would it be in the center? I recently used the envirotex lite epoxy on my counter. I only used a paintbrush on the curved edges of the counter, but to spread it out on the flat surface I used a plaster spreader tool (joint/tape knife tool). Maybe that will help you. Good luck! Thanks for the feedback, Corinne! Did you use all 3 shades of gray? thanks, can’t wait to try this in my bathroom! I’m considering doing this in my kitchen and just wondering how it’s held up over time… can you set hot pots on it or do you have to be really careful around it? I love this – it looks beautiful! I really want to do this to my kitchen laminate counter top. But I’m so afraid I might mess it up and then it’ll cost me more to fix it, lol. Thanks for commenting, Corrine! I think marble is so classic, it will look great with any color cabinets — if you look up “light wood cabinets with marble” there are some beautiful kitchens with cabinets like yours and marble counters. Good luck! Ooh, it looks so good! Would you mind if I shared your pictures over on Facebook with our fans there? Thanks for sharing, Corrine! Sure, you can share the pictures! How has this technique held up over time? Love the look, just wanting to know the durability before trying! Hi Michaela! Our friend Ronda over at Batchelors Way is the one who did this project, which we loved and wanted to feature here 🙂 So if you’ll head over to her site (linked up toward the top of the post) then you can ask her there. I believe she may have even already posted an update about how it’s holding up. Either way, she’ll have more information for you! Thanks! I’m wondering if this project is possible on laminate counters that are originally darker? Would I just add a couple layers of primer and possible add a white coat of paint or sand them prior? Brenda, I imagine that would work wonderfully! You can pop over to Batchelors Way and ask Ronda for her opinion there, since she is the pro who shared with us here. Thanks! Thanks, Alyssa! Ronda is amazing! wow this is the craziest (in an awesome way) diy idea I’ve seen! Mind blown. Right? Rhonda is brilliant 🙂 Thanks for the comment! Was wondering if this is too hard to do, to already established bathroom countertops? I tried to read/scroll that and see, and assume that is what others are doing. Hi Tammy! On existing countertops, you’ll just need to make sure to protect the surrounding area, especially when you seal it with the topcoat, more like in this tutorial: https://www.remodelaholic.com/2012/02/glossy-painted-kitchen-counter-top-tutorial/. Wow, that really is amazing! Plus way cheaper than I thought it would be. Great DIY for when you’re on a tight budget. Thanks for the tip, Carra! You can also use a blowtorch like Dawn did here.